Russian attack bomber, heavy fighter and ground attack Petlyakov Pe-2 and Pe-3. Type: Attack bomber, dive bomber, heavy fighter, ground attack, reconnaissance aircraft. 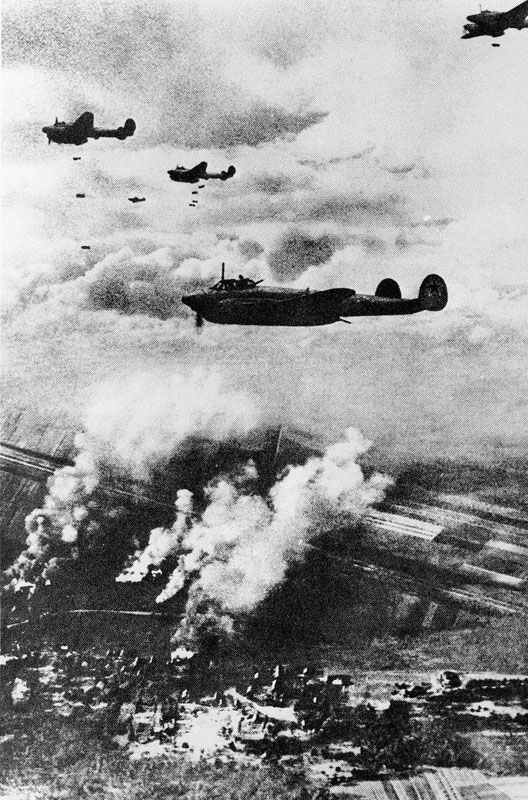 Bombing attack by Petlyakov bombers. In a long operational career the Petlya­kov Pe-2 was extremely successful in a variety of roles: heavy fighter, light bomber, ground attack, reconnais­sance and night fighter. It may well have been the most versatile Russian combat type to enter service during World War II. Over 11,000 Pe-2s were built, and the type was improved steadily throughout the war. Along with the equally effective Ilyushin Il-2 Stormowvik, the Pe-2 provided the spearhead of the Red Air Force’s tactical bomber units. The Pe-2 project got under way in 1938, when a team headed by Vladimir Petlyakov began designing what was to be an extremely advanced aircraft for its time: a heavy twin-engined fighter with a pressurised cabin for high­altitude combat. This was however never completed, because its specifica­tion was superseded by a call for a high-­altitude bomber instead of a fighter. But despite the change in specification, much of the original design was kept. When the prototype appeared in 1939, its elegant lines created something of a stir, and its handling proved unusually lively for a bomber. Tests then revealed that the high-altitude sighting equip­ment was not satisfactory, and it was decided to convert the aircraft into a dive-bomber. The main alterations were a reinforced and reshaped tail­plane, and the installation of dive brakes on the wing under surfaces. It was this version of the Pe-2 that was first put into production and, beginning in 1941, first delivered to units. An all-metal, low-wing mono­plane with twin vertical tail units and a retractable undercarriage, it was powered by 1,1OOhp Klimov M-I05Rs driving three-bladed variable-pitch metal propellers. This Petlyakov was the first Russian type in which great attention was devoted to the arrangement of the controls. In fact it was almost overdone: there were 18 electrical servo-mechanisms and a hy­draulic system for the main controls. The dive-bomber version was fol­lowed by a heavy fighter that could also be used for long-range reconnaissance and ground attack. Beginning in 1942, the armament and armour were chan­ged to allow the plane to withstand the newest German fighters. An improved version appeared in 1943. It was powered by 1,210hp M-1O5PFs and incorporated several aerodynamic and structural altera­tions. The final versions, developed late in WW2 , were a long-range reconnaissance model, a trainer and a high-altitude fighter. Ironically it was an accident with one of these aircrafts that Petlyakov lost his life in 1942. These Pe-2 examples have the lower ventral gun but no loop aerial under the nose. Comparable with the somewhat later Mosquito in performance, these are Pe-2FT models with PF engines. Unloading bombs for Petlaykov Pe-2 dive bombers on a airfield east of Nowosil during the Battle of Kursk in July 1943. The open bomb doors give a clue to the remarkable internal load of 6,615 lb that could be carried by later models with the M-107 engine. There were many different types of nose and countless equipment and armament variations. Tagged 1942, dive bomber, light bomber, red air force, russia.